In 2019, we released Tattu R-Line Verson 3.0 120C high discharge rate batteries, they are designed for professional FPV racing events. Tattu R-Line is made to devour the racetrack and power your amp hungry quad, giving you the edge in competition. It’s the best choice for high speed racing events which can maximizing performance and durability. 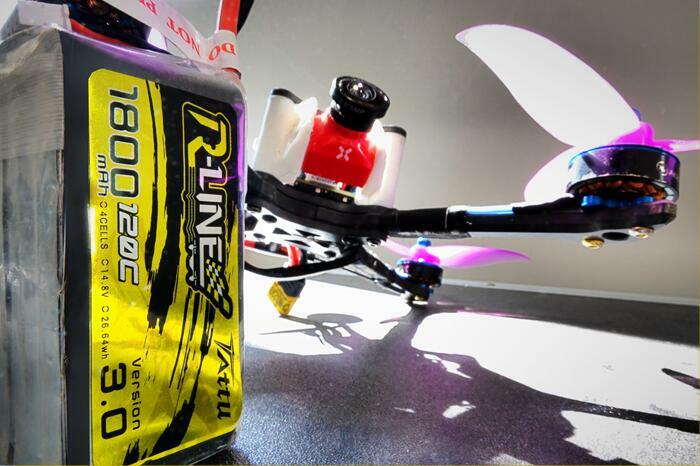 As a new standard high rate FPV racing lipo battery series for serious pilots who require POWER ON DEMAND. Hold a higher voltage charge per cell, lower internal resistance and compact size which results in more potential power for your FPV. Tattu R-Line Version 3.0 ensure you a wonderful flying racing experience. What are features of Tattu R-Line Verson 3.0? Version 3.0 Batteries with higher capacity than comparable size packs. Longer battery life ensure your drone get the maximum flight time, let you enjoy focusing on flying longer than usual. Tattu's R-Line is made to devour the racetrack and power your amp hungry quad, giving you the edge in competition. Perfect match for your FPV Drone and compete on the highest level. Higher performance and higher energy density. R-Line made for race. Even if Higher C rate, come with a compact size which still allows a great connection between high capacity and reduced weight. Internal resistance is one of the primary concerns about FPV battery maintenance. Lower internal resistance can delivery potential energy stored in the battery to the model aircraft easily.